Today it’s time to get back in the kitchen and cook something Vietnamese. I loved the food so much on my recent trip there and even did a cookery course at the wonderful Victoria Phan Thiet Beach Resort and Spa. Vietnamese cuisine is considered one of the healthiest in the world. It incorporates lots of fresh herbs like lemongrass, mint, coriander and basil and spices like ginger, chilli and cinnamon. You’re often given a plateful of aromatic herbs to add to your dish at the table. We ate Pho at the rooftop bar of The Majestic Hotel in Saigon. A huge bowl of tasty broth with plenty of noodles and the meat of your choice, served with that aromatic plateful. I left Vietnam armed with recipes to try at home and today it was time to make some Pho. It does take some time as the flavours need to infuse properly, but it’s very little work with amazing results. Go on, give it at try. Place the ginger and shallots on a baking tray and roast in the oven for about 30mins until soft and cooked. Leave to cool and then put in a blender to make a paste. Place a large pot on the hob and turn on to the lowest setting. Add the vegetable stock and water, star anise, cinnamon stick, cloves and ginger and shallot paste and stir. Leave to heat through and bubble slightly for half an hour. Add the two whole chicken breasts and leave on low for them to poach for one hour. 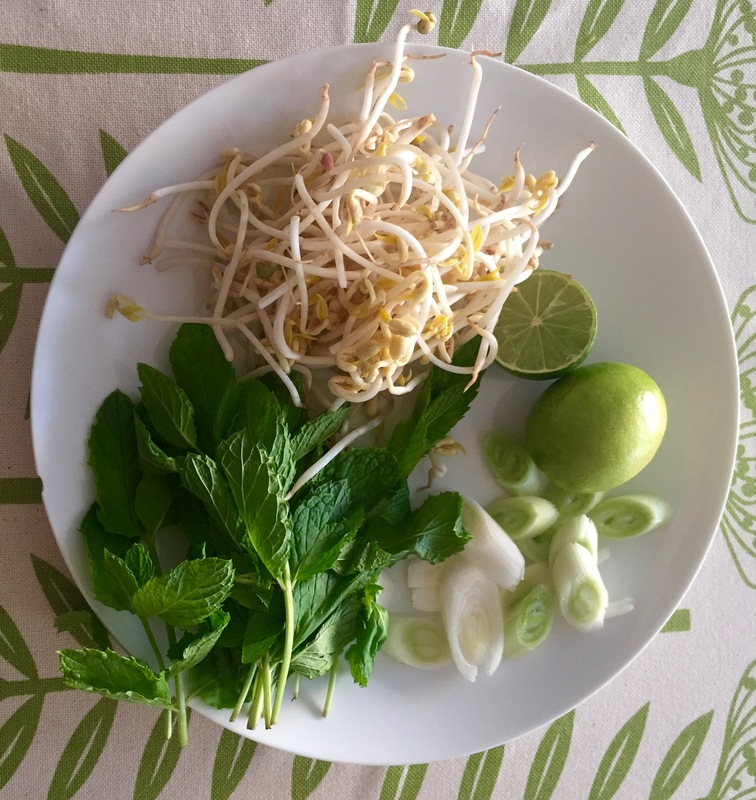 Meanwhile, arrange the bean sprouts, spring onions, mint, basil and lime on a plate. After the chicken has cooked for an hour, remove it from the pan and add the noodles. Warm through for about 5 mins and while that is happening, slice the chicken. Ladle out the noodles and broth into a bowl. Place the sliced chicken on top. Serve with the herb selection which gets piled on top of the chicken broth mix. Squeeze over the juice of half a lime and tuck in. Pho works equally well with beef. Instead of the chicken breasts, add 250g of rump steak and let it simmer in the mixture for about 2 hours. You should always tear fresh basil rather than chop it to retain maximum flavour. Try different adding different herbs like coriander or parsley to your Pho. 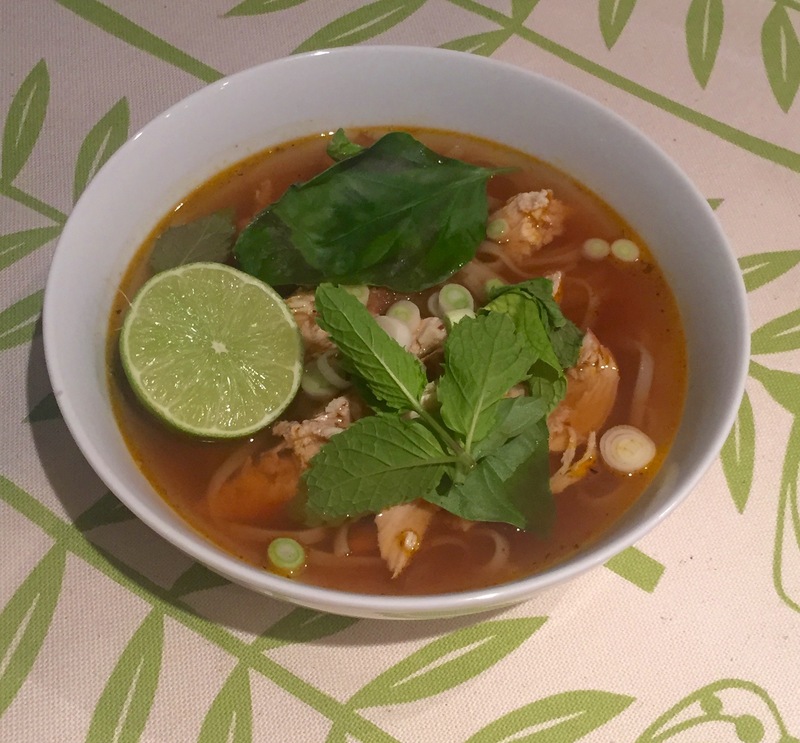 Vietnamese cooking doesn’t use a lot of chilli but if you’re a fan of hot stuff, up the chilli in this recipe. Pho is also great for vegetarians, simply leave out the meat. It also works well with fresh prawns. Just drop them in to the simmering mixture for about five minutes before serving, until they go pink. 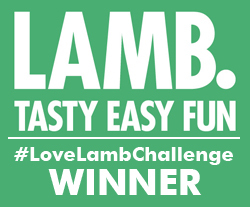 I’ve used 200g of noodles here, if you’re a big noodle fan, add more – it can make a substantial meal. 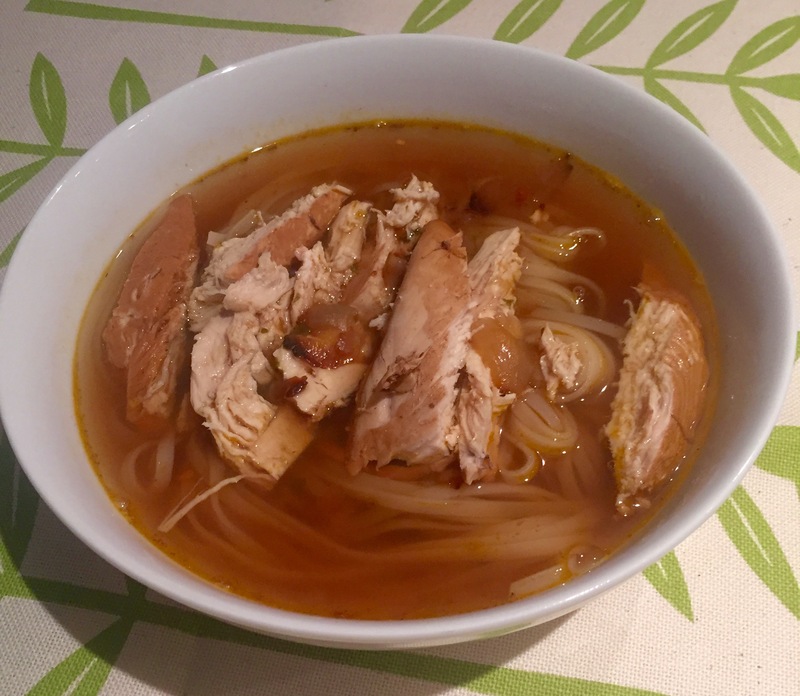 Do you have a favourite Vietnamese recipe? What did you eat while you were visiting Vietnam. Let me know, I’d love to hear about your experiences.